Today I’m interviewing Amy Hamilton. Amy’s spoken at a TEDTalk, served in the US Army, and is writing a book. Truly a woman of many talents! I asked her how she got started. Amy, how did you get started in project management? I have been in the IT field since I graduated from Eastern Michigan University and was commissioned in the US Army. Much of what an Army Signal Officer is expected to do is really project management. The names and processes are different, however, but very results focused. I decided in 2007 to obtain my PMP® and that is when I really become serious about formal project management. What is your current role? Tell us about your career path. I currently perform IT Project Management for the US Government in Stuttgart, Germany. In my career I have served as an Army Officer on Active Duty, as a contractor in the IT field for the US Government and for the past ten years as a Government Civilian. I have also worked as a part-time facilitator for Boston University’s Project Management Program and taught Project Management Tools at Colorado Technical University. My time in Stuttgart is limited to five years, so I should be back in the US by 2021. I would like to move to the National Capital Region for my next assignment. You’ve spent time volunteering too, haven’t you? I have been a Board Member in several professional organizations including my local PMI Chapters. The hardest projects to lead are in volunteer organizations. It is much more difficult to motivate a team of volunteers than paid employees. Leading a project in a volunteer organization can really help a project manager to explore their team building skills! What’s the one thing you had known when you were starting out? I think to network more. Often as a woman in a career field surrounded by men, it is easy to close yourself off and feel isolated. It is important to stay engaged and not isolate yourself. What is your biggest challenge in your career right now? Right now it is difficult to predict the future of technology. Technology is changing so quickly that often by the time an IT project is completed, new technology has already been developed that is superior. Your TEDx Stuttgart talk was great. What was that experience like? TEDx Stuttgart was a great experience and I wanted to share my concept that Life is the ultimate project. I find that project management is very important to my personal life and am working on a book, which should come out soon. It is written as a leadership fable and many of the traits of my main character are based on people I know and have worked with. Life can be messy and chaotic and project management can help people be more organized and reach their goals. Life can be chaotic. Project management can help people reach their goals. That will help other people. What type of career development things are you working on for yourself right now? I am currently working on a Master’s Degree Certificate from the US National Defense University and am starting a PhD program in Organizational Leadership from Regent University in Virginia Beach, VA, USA. What advice do you have for women in project management who want a similar career path to you? Women have come a long way in project management and in the US Government. A key for women in any field is not to limit themselves or be intimidated. Another key is look for mentors in your field who aren’t your direct supervisor. 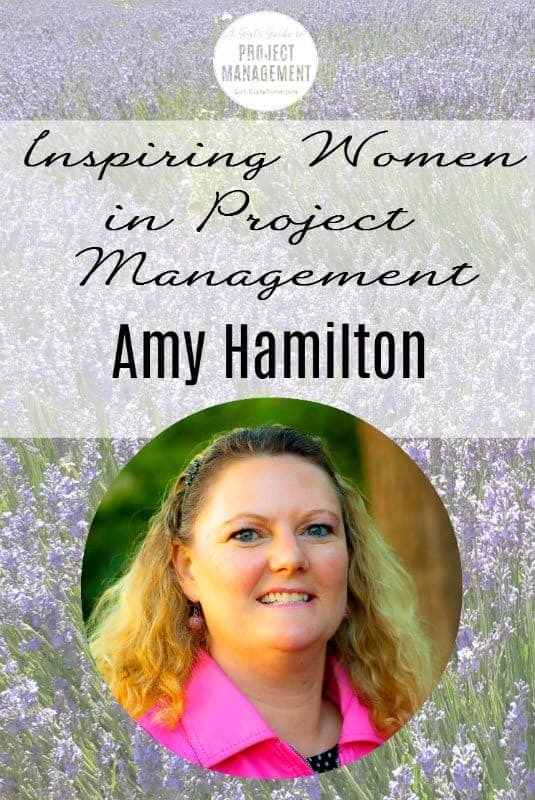 Elizabeth Harrin did a great job its article is really very inspiring special thanks to Amy. It’s very helpful for me to understand. Loved this article and Amy truly is an inspiration!